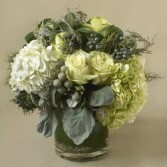 Clear Posie Vase with Premium stems of Hydrangea, Roses, Alstromeria with nice Christmas greens, cones and ribbon. Perfect for a table setting or just a beautiful arrangement for the home. 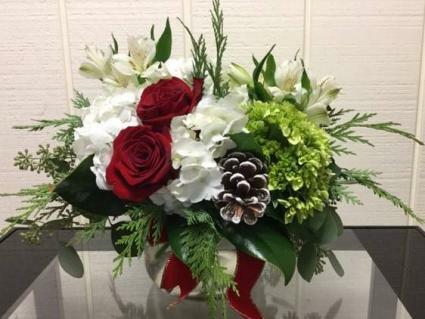 Beautiful red gerberdaisy with mini green hydrangea arranged in a clear rectangle vase lined with an aspidistra leaf, loaded with mixed seasonal greens, white hydrangea and red roses.Ideal Holiday gift for Santa's Helper!